Sept. 13, 2018 - The California State Summer School for Mathematics and Science (COSMOS) program at UC Irvine marked 18 years this past summer. Held in July, COSMOS offers an intensive four-week residential learning opportunity for high schoolers. Taught by UCI faculty and others, the program’s mission is to motivate and encourage the rising generation of scientists, engineers and mathematicians. This summer, UCI COSMOS accepted over 180 top California high school students from more than 1,000 applicants. In clusters of 20-25, they studied fields ranging from mathematics to genomics to astrophysics. This year there were nine clusters offered, two in engineering topics. Mechanical and aerospace engineering professors Derek Dunn-Rankin, Faryar Jabbari and Ken Mease have taught a cluster titled Engineering for Land, Air and Space since the program’s beginning in 2000. This summer, a new cluster was offered, called Sustainable Civil Infrastructure: Engineering Needed for California’s Future. 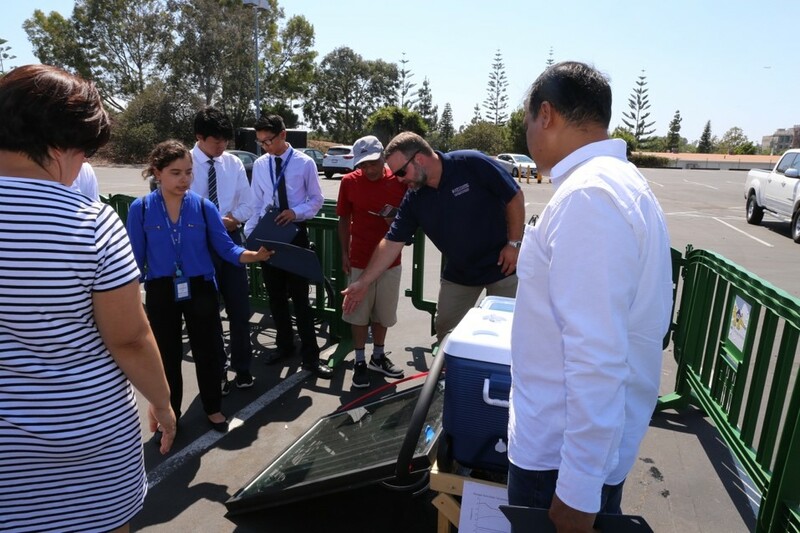 It was led by Joel Lanning, UCI assistant teaching professor of civil and environmental engineering (CEE), and Garrett Struckhoff, associate professor of CEE at California State University Fullerton. This new cluster topic centered on green technologies aimed at California’s civil infrastructure challenges. Local field trips focused on CEE sustainability issues and solutions here in Orange County. Students toured the OC Water District’s Ground Water Replenishment system and collected and analyzed data for the Crystal Cove Conservancy at the park, on coastal erosion and runoff water quality. Twenty-two students divided into six teams to complete projects. Students constructed a 1/4-scale building out of structural timber, which represented a residential unit within a larger complex. Dubbed the “Cluster 9 Green Clubhouse,” it served as the base for the students’ green-infrastructure prototypes. 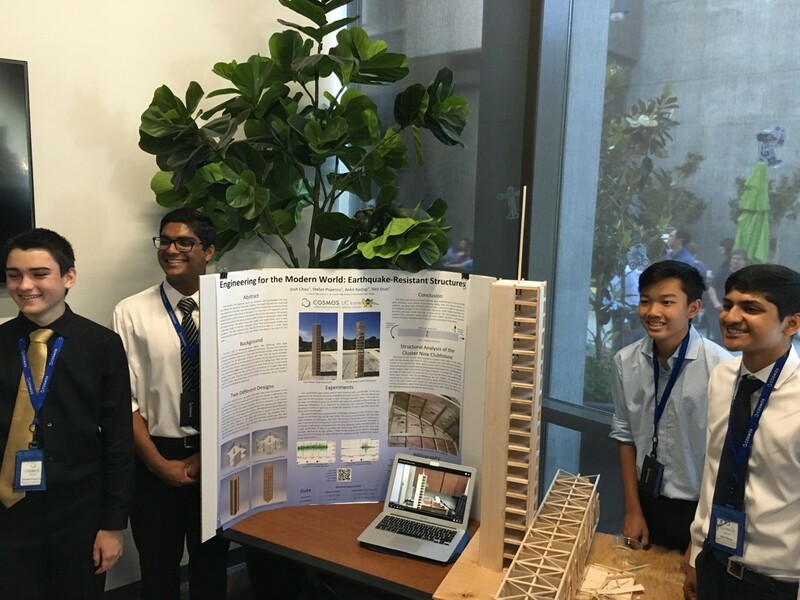 One team investigated the impact various roofing methods had on the urban heat island effect and internal heating and cooling energy consumption. They designed and built a green roof, or garden roof, and compared it to a traditional shingled roof and a white roof, which was a very low-cost solution of simply painting shingles with white elastomeric paint. They found that while the green roof provided the most insulating effect and also mitigated storm water runoff, the white roof provided the most cost-effective reduction in internal and radiated heat from the harsh summer sun. Other teams added to the clubhouse a solar water heater, a solar desalination system and an “algae shade,” in which algae was grown in an elevated and sloped aquarium with the dual purpose of providing shade for the Green Clubhouse and for growing and harvesting algae for biofuel extraction. The seismic systems team built scale models of 20-story buildings, of which the clubhouse unit was conceptually a part, and compared two common seismic bracing designs. The students tested their models on a small shake table, where they investigated the dynamic properties of the buildings and shook them to failure under large simulated earthquakes. Finally, another team studied dams and reservoirs from which the green unit would conceptually receive its water. After investigating nearby topography, the team selected a design and built a scale model of the dam and surrounding topography to model their reservoir. COSMOS has been funded by the state legislature since 1998. Irvine was the founding COSMOS campus. UC campuses at Davis, Santa Cruz and San Diego also participate.